I have recently upgraded to Storyline 360 and have just encountered my first issue. I have set up a drag and drop screen with and 2 drop zones and ~13 drag items. When you drag an item onto the correct zone it gets stuck to the cursor and does not drop properly. I have played around with revealing items one at a time and letting items drop on incorrect drop zones, but to no avail. I know it is still new but still any help would be appreciated. I've had a look at your file and while I have no idea why that is happening or how to fix it, the good news is that I published it and tested it then (I published to to be quick) and it worked just fine. Perhaps submit a support case to Articulate about it, but it seems to only happen in Preview mode. Have you tested after publishing? Hi there Tom, thanks for sending over your file! I was able to see the behavior you described. I did some testing, and it seems like there was some erratic behavior associated with the drag text boxes. I deleted those, and replaced them with two new 'test' text boxes, and the interaction works as expected. I attached the updated file here so you can test it, as well. You may need to delete the drag text boxes on that slide and rebuild them. If you'd like to have one of our Support Engineers do some further investigation, you can reach out to them directly here. If you do decide to go that route, please share your case number here so I can follow along. This is an ongoing bug, I'm disappointed it hasn't been fixed. What was the solution to the problem? Aside from rebuilding the slide, I cannot find one. Hey Jenny. Can you describe the experience that you're having? Do you have a drag item (or group) that takes an extra click to drop? I'm happy to look at your file as well, if you'd like to attach it. Thanks! Hi, I'm experiencing the exact same issue like Tom. this happens after I updated to v3.7.12674.0 which was released on July 19, 2017. In previous July 11, 2017 updated, this problem doesn't occur at all. Hey Emalyn. Can you attach your .story file here so I can see the setup? It sounds like Tom's issue might have been due to some elements being corrupted. After Alyssa rebuilt them, the interaction worked as expected. I'd like to try to dig into your file, too! Thanks. I was able to resolve a similar issue by re-building my drag and drop completely from scratch. I re-inserted all my icons and built the drag and drop slide from scratch (don't copy/paste anything from the existing knowledge check with the bug). In my case, I had built a module in Storyline 2, converted it to 360 (for reasons too long to describe here). Once it was converted to 360, my drag and drop interaction did not function properly when viewing the story_HTML5.html version. When I click to drag an icon to a drop target, it would stick to my mouse until I clicked again to keep it in the drop target. We've found a problem with Storyline 360 Freeform Drag and Drop interactions in HTML5. Specifically, drag items do not drop or "stick" to the target when you release the mouse. This happens when you set Shuffle to Answers and Snap dropped items to drop target to Tile. 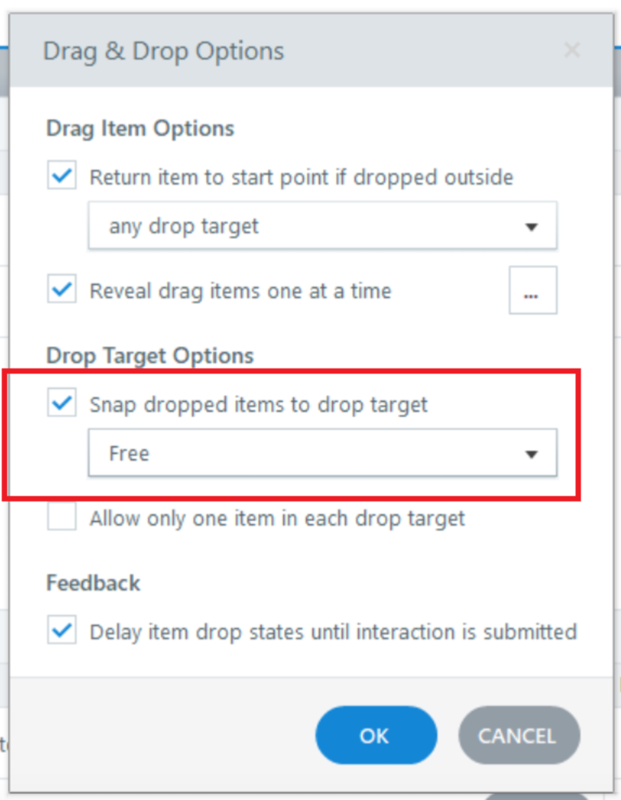 In the Drag & Drop options, set the Snap dropped items to drop target to Free. We'll be sure to let you know once we have an update on this issue! I continue to have this issue. I even rebuilt my interaction. It worked initially, but now it's back to not working (i.e. not snapping to object). I guess I'll just have to remove this interaction from my presentation as I've had learners report this issue after it's been published to my LMS. Were you not able to use the suggested workarounds that Alyssa shared? What did you have your drag/drop items set as for those two settings (Shuffle and Snap)? Yes. I tried to use her workaround and it didn't work. Sorry this is still giving you headaches, Amanda! I'd love to take a look at your file. Would you mind sharing it with me? You can attach it here or use this form to send it privately. I'm sorry that's causing frustration for your learners. When you have a chance, can you share a copy of your file this is happening in here so I can take a look? You can add it as an attachment right to a comment in the thread. New guy here! Had the same issue after conversion from SL2 to SL3. The problem is caused by Storyline's "Markers" (i.e. checkmark, x's, etc) when used in the States (for correct/incorrect drops). It works once these markers are deleted or swapped with something else like text or png images (of checkmark, x's). Thanks. I know our team is investigating some changes to the drag and drop behavior of Storyline 360 when upgrading files, but I wanted to test out your idea. You mentioned markers and I wanted to see if you meant Storyline's markers or items you inserted as a shape/icon? If you have a copy of the .story file that you created in SL2 could you share that so that I could try upgrading it to see how it behaves and what settings you've included? I am having the same issues with the drag and drop in 360! I hope they will fix the bug soon! In the meantime is there a way to go back to the version released before 11 july 2017? ... I wanted to see if you meant Storyline's markers or items you inserted as a shape/icon? Actually, it is both 'storyline's markers' (i.e. the prebuilt thingy with the text bubble) or any 'grouped' shapes that are causing the issues. A shape on it's own (not grouped) works fine; png files work also. It's not a huge problem for me as long as there's a workaround. I've attached 3 slides in SL3: 1 works; and 2 that doesn't work (markers and grouped shapes). See the States. Thanks. If you'd like to get in touch with our Support Engineers they can look into options with you. Thanks for sharing the file - I'm taking a look now. During Preview and in HTML5 output, I see how those states are not appearing as expected when dropping the item. In fact, once the item has been dropped, it's behaving very strangely and not even attached to the cursor when I try to move it again. In the Flash output, the states appear as expected, but trying to move the objects again makes them behave a little strangely. We didn't have this behavior documented, so thanks for pointing it out. I'll get a report started for our QA folks. In the meantime, can you ungroup the shapes? Using ungrouped shapes worked both in Flash and HTML5 output. As for using markers, were you looking to include the functionality of the marker in that state (title and text box, media, animation)? I put in a case to Justin on this issue. Using Instist recommendation, I got rid of any symbols in my presentation and I changed the output to Flash and HTML5 output instead of HTML5 and Flash and my drag and drops now work. In fact I build the D&Ds two different ways and they both work. I see that you worked on this with Leslie, and she reported it to our team as a possible software bug. We'll keep you posted here once we have any updates. Noticing the same the problem with an interaction originally built in SL2 and now updaing with 360. Only difference here is that this is built using triggers, not a free form question slide (so, AFAIK there is no way of accessing the drag item / drop target) settings mentioned above. Re-read this thread and removed change object state triggers from the drag item.The drag and drop is working as expected now. Looking forward to hearing how the overall issue is resolved. Thanks community!